Everything alive today shares a common ancestry of nearly 4 billion years duration. Humans, even scientists, cannot conceive or understand the implications of this timescale! Consequently, we always, always underestimate living things. Recent investigations have begun to reveal the remarkable sophistication of the “information technology” inside all organisms. This talk will review the place of mankind in the universe, the amazing history of our evolutionary origins, and the remarkable biological mechanisms that propagate, from one generation to the next, the information that makes each of us unique. A breakthrough in the understanding of gene expression came with the realization that cells use RNA-guided search engines to identify and regulate both the DNA and other RNAs. First identified in a simple worm C. elegans as “RNA-interference” (RNAi), mechanisms related to RNAi have now been discovered in all domains of life. In RNAi-related mechanisms short pieces of genetic code in the form of RNA serve as search queries allowing the cell to rapidly identify and regulate genes in much the same way you type a short query into Google. Scientists can now enter synthetic RNA search queries into cellular search engines called Argonautes, and recently CAS9/CRISPR, allowing them to precisely cut any cellular RNA or DNA. The result is an unprecedented revolution in molecular genetics that promises to help unlock the secrets of life, and to speed the discovery of new medicines. This talk will describe how organisms use these remarkable mechanisms to program gene expression and how scientists and physicians are learning to use them as tools. But, what this talk is really about is the excitement of science and the ever unfolding and deepening mysteries of life. Caption: Worm embryos showing nuclei of early embryonic cells (A, black circles, B, outlined by red rings, C, orange circles, and D, blue circles). 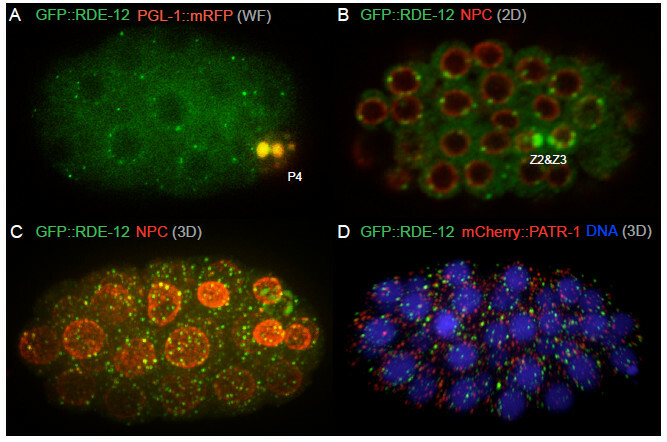 Embryos are stained to reveal macromolecular RNA complexes, tiny green spheres, that represent the equivalent of Information Technology (IT) centers for the cell. In A, B, the immortal lineage (germ cells: P4, Z2&Z3) are labeled. Large Yellow and Green spheres represent ramped up IT centers in these immortal cells. 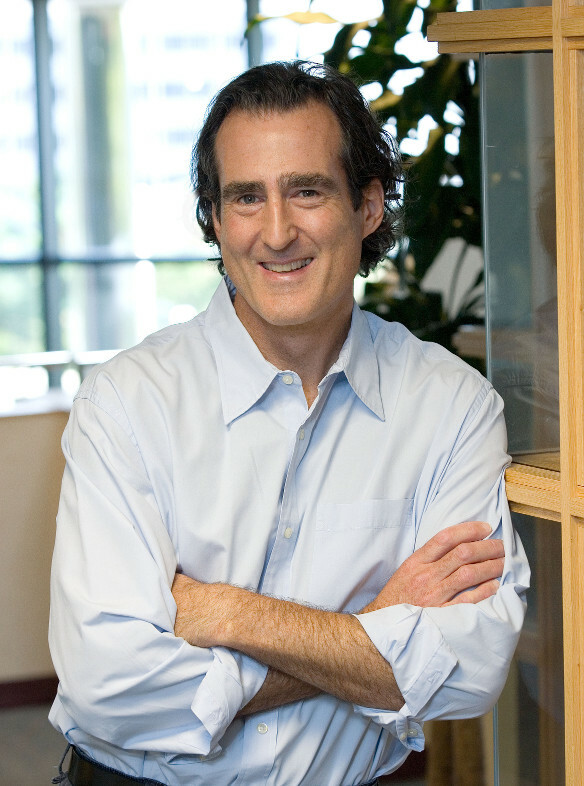 CRAIG C. MELLO is an Investigator of the Howard Hughes Medical Institute, holds the Blais University Chair in Molecular Medicine, and is Co-director of the RNA Therapeutics Institute at the University of Massachusetts Medical School. His lab uses the nematode worm C. elegans as a model system to study embryogenesis and gene silencing. His collaborative work with Dr. Andrew Fire led to the discovery of RNAi. Together they showed that exposing C. elegans to double-stranded ribonucleic acid (dsRNA) induces a sequence-specific silencing reaction that interferes with the expression of cognate cellular RNAs. RNAi is related to ancient gene-regulatory mechanisms found in both plants and animals. RNAi mechanisms are essential to life and are now employed by scientists to explore the biological functions of genes, study disease processes, and design new therapies. Dr. Mello earned a BSc from Brown and a PhD from Harvard, and he did postdoctoral work at the Fred HutchinsonCancer Research Center in Seattle. He then joined the University of Massachusetts Medical School as Assistant Professor and has continued his research there ever since. Dr. Mello has received numerous prizes and awards for his research, including a Pew Scholarship, the National Academy of Sciences, Rosenstiel, Gairdner Foundation, and Janssen Awards, the Wiley, MGH Warren Triennial, and Ehrlich – Darmstaedter Prizes, and, together with Andrew Fire, the 2006 Nobel Prize in Physiology or Medicine. Mr. Mello is a member of the National Academy of Sciences, the American Academy of Arts & Sciences, and the American Philosophical Society.